Homes across all price levels are getting more expensive. But the biggest increase was in the cheapest set of homes (up 12.4 percent), and the smallest jump was for luxury houses (up 10.9 percent). Seattle-area home prices are now rising at their swiftest pace in 2½ years, and the region is closing in on Portland for the title of fastest-growing home prices in the country. The typical single-family house across Greater Seattle cost 11.4 percent more in August than it did a year ago, according to the new Case-Shiller home price index released Tuesday. That’s the eighth straight month of double-digit growth, and the biggest annual increase since March 2014. Home prices grew at a similar rate in 1998 and soared even faster during the lead-up to the mortgage bubble in 2005 and 2006. Portland again led the country, as it has all year, with home prices up 11.7 percent compared to a year ago. Both cities once again saw home costs rise at more than twice the national rate of 5.3 percent. The nationwide jump was the biggest in several months. But the gap between the Pacific Northwest cities closed significantly in August after Portland had for months had a comfortable lead over Seattle, as the two have been No. 1 and 2 in the country, respectively, all year. 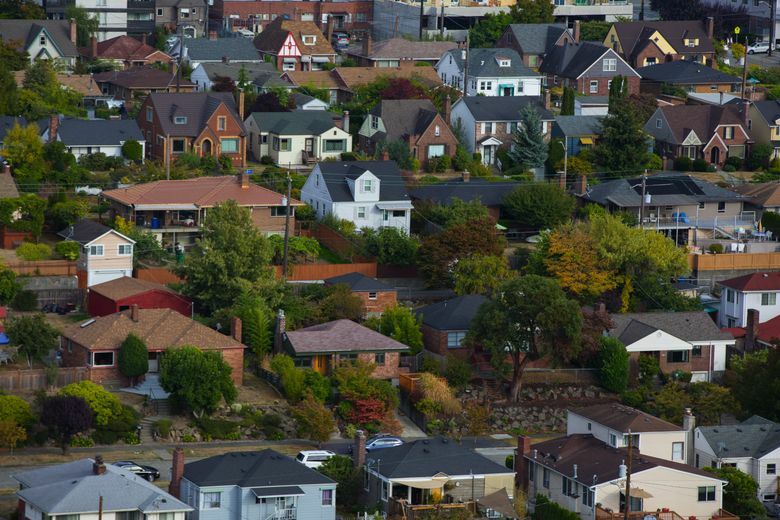 Seattle also increased its lead over third-place Denver, where prices rose 8.8 percent. 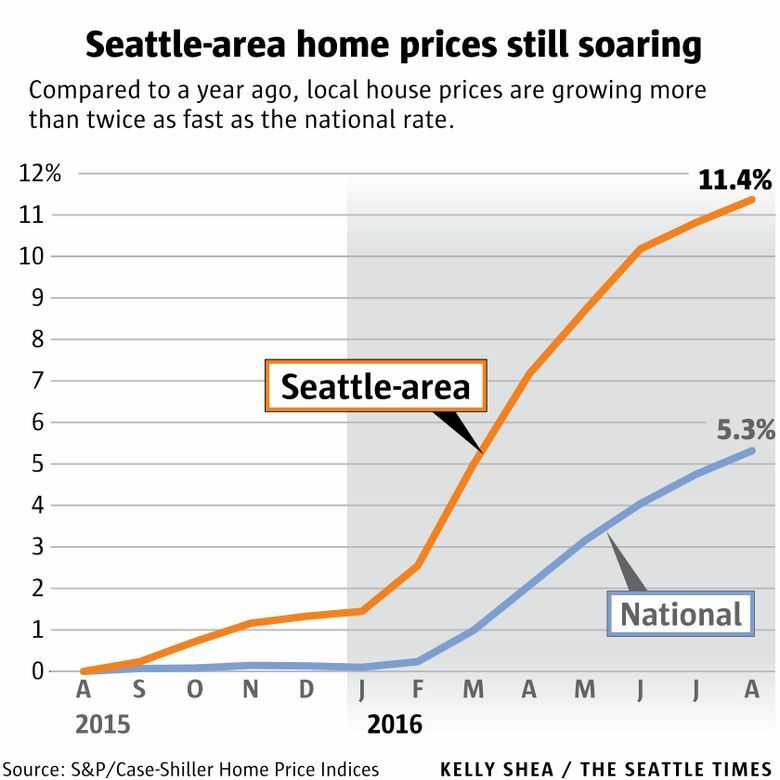 Looking at just the month-over-month price gains, Seattle’s 0.5 percent increase matched the national rate and was behind only a few other major cities. That’s a change after last month’s short-term growth in Seattle had dipped well below other cities for the first time in a while. Still, it’s the smallest monthly increase for Seattle since the start of the year, and way down from the 2.4 percent monthly growth seen in the spring, when home buying peaks. Home costs have now been soaring consistently for more than four years, and have surged 59 percent since 2012. The effect has been even more pronounced for starter homes, which have seen prices skyrocket 75 percent since 2012. Seattle’s price index reached a record high for the sixth straight month, the Case-Shiller data shows. The local region surpassed its old pre-recession high earlier this year, unlike the rest of the country, which remains just shy of record territory. Homes continue to cost more and more in large part because there are fewer and fewer houses available, leaving buyers to compete over limited inventory. But another batch of new data shows just how much homebuyers have to fight for scraps. That findings suggest that even the homes that are coming onto the local market often require extra money to fix up after the sale goes through. Still, locals get an average 8.7 percent discount by scooping up a fixer-upper compared to buying an average home, Zillow says. For sellers, more are confident they can unload the house “as is” and don’t repair the home before putting it on the market. The Case-Shiller index looks at single-family home sales in King, Snohomish and Pierce counties but does not include actual house prices. The most recent data from the Northwest Multiple Listing Service showed the median house in September cost $538,000 in King County, $395,000 in Snohomish County and $279,000 in Pierce County.